As a team we want to create a legacy of an ongoing swimming challenge that will provide an opportunity for veterans to find peace and opportunity following their courageous service to our country. In early August this year, our team of four will attempt to swim across the English Channel. We are raising money to establish the Swim Program for Soldier On and have an ambitious target of $50k to accompany this ruthless physical challenge. Soldier On’s mission is to work side by side with those who serve and protect Australia, and their families, helping them to secure their future. We are Natasha Moore, Tim Sanders, Andrew May (Maysie) and Megan Webber – a serving member of the Australian Army and a Soldier On ambassador. 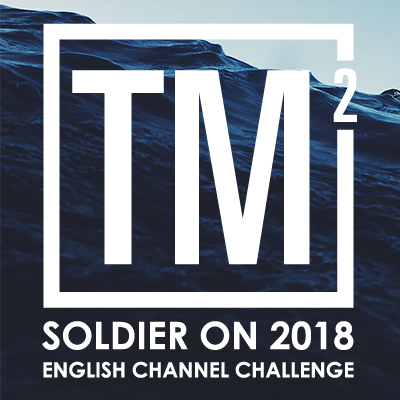 Together, we are the TM2 team conquering the English Channel in 2018 for Soldier On. We appreciate the importance of meaningful engagement, family/community support and physical activity in rehabilitation and recovery. With gratitude and appreciation to those who now struggle as a result of their service to Australia, we hope the TM2 team can contribute to their recovery by raising a bucket load of cash and establishing the Soldier On Swim Program. Find out what motivates each of us and follow our journey on Facebook. Great swim showing so much courage. Thanks for the experience TM2. Proud to be a part of this team, raise all of this money for Soldier On and to swim the English Channel!! Good job Tim, proud of you mate. I m sure you ll smash it team! Go Megan! Good luck with the Swim..... very proud of you all Team! Good luck Tim!! We are sure you will NAIL IT with your positive attitude and your wonderful team working together!! Dear Uncle Andrew, We are so proud of you and wish you all the very best for your swim. Love Zahzie, Indie and Gracie. So honored to be connected to such a tremendous person and incredible athlete. We re proud and grateful to know you and call you friend. Thank you for inspiring us and doing so much good! Go Tash Tim! Can t wait to hear how the journey unfolded. What s next on the bucket list ! Admire you all and thank you for being part of such an important cause. Good luck! Good luck and well done Tim, a huge challenge for a great cause! Good luck with this great personal challenge, and thanks for your efforts towards the Soldier On cause. Swim with a strong current Tim, Tash and team! Good luck Tim and team! Get at it! From your friends at the program office. Swim hard, Tash and friends! Good luck Tim!!!! Your amazing and what a great cause ! Fantastic effort for such a good cause. Go well! A very inspiring and gutsy challenge, and all for a great cause! Good luck team! Go Tim Tash!! Incredible feat so far, all you have left now is the easy part, the swim. Good luck Maysie and rest of the team . Good Luck and hopefully we can follow online or throughFB updates. Great work team thank you for all of your efforts in promoting such a worthy cause. All the best! Amazing effort and for a great cause. Good Luck! Great effort, thank you for raising the profile of SoldierOn and showing what can be done when you push yourselves. Fantastic Cause. All the best for the swim team. Good luck to Tim and all the Team! England is in a heatwave right now so i hope the water is a little warmer for you. Well done. Awesome effort Tim! Good luck with the swim. Good on you Freddy, tough gig but for a great cause! Good luck Tim Co. Great cause indeed! All the best Tim, swim safe, this is an amazing thing your doing! Lehmensich family. Go Maysie. A lot of effort has gone into this one. Wishing you and the team great success and looking forward to having you back on the bike soon. Best of luck with the swim I look forward to seeing you return to cold Canberra! Swimming the English Channel I get tired car pooling! Amazing effort team. Hats off to you team. A huge and inspirational effort. Well done and good luck. Huge thank you to Jason Serena Burford, Vicki Lanagan, Matt Franks, Allyce Hunt, Jo Andy Smith, Dave, Meagan Jasmine Carrol today we sold 700 sausages and raised more money for Soldier On. Best Wishes to Tim and the team. With all that training....you 'll nail it for a great cause! Fantastic effort Tim and team. Best of luck! You guys are awesome!!! So proud and will be following your progress. Sitting here on a Friday night, enjoying a port while our troops are serving around the world. Happy 40,000 SoldierOn! Go Tash and the rest of the team!! Massive effort team. Hats off to you all, love the cause and selfless application. Go well. You 'd do anything to get away from Canberra winter! Go well all of you, and SoldierOn. Great cause Maysie. Good luck! You 're mad...I love it. Swim hard, Megan and team! The last of the cocktail party money, from raffles and alcohol returns. This skyrockets our cocktail party fundraising efforts to almost 13000. This includes those who tried to crash the website!! Thanks again to everyone who supported!! Good luck Meggsy, great effort! And because I am a good bloke .... Go well Tash and TM2 super proud of you all. Challenge accepted for next financial year And thanks to the generosity of the good folk in Albury and Wodonga our cocktail party was a tremendous evening. Tm2 are an inspiration to everyone with an interest in Australia and those who serve us. Challange accepted!!! Good luck with the big swim Megan and team!!!! A huge thank you to everyone in advance for supporting the Soldier On Cocktail Party at the Army Logistic Sergeants Mess. It is going to be an amazing night, I can t wait to see you all there. At ONTHEGO Sport we could not be prouder to support such a great initiative. Natasha and the team are living and breathing our core values of making Every Day Matter and giving back to great causes. Thank you all for giving us the opportunity to support your cause by providing amazing apparel. Look forward to seeing some great imagery on your crazy adventures. All the best! You ve got this! Good luck and enjoy the swim! May the tides work in your favour. I will be watching with a little envy. Good luck all. You are such an inspiration Megan. Good luck with the swim. Lots of love Jo and Nev. Proud of what you stand for Tash. Have a safe swim. Blessings from heaven and earth. Better you than me, you crazy people! An amazing feat for a great cause. No go forther and conquer .... without freezing!!! All the best hope the weather is good. Hope the swim goes well. Stay safe. Good luck Tash and Tim!!! Natasha, Tim Team awesome commitment to a great cause that I 'm happy to support...sure beats my 2.2km Saturday morning swim squad set! Please stop posting pictures of you in your budgie smugglers. To Natasha and the team, Congratulations for having a go! What an experience! What a great cause! All the best on the big day! Please accept this donation from ADF Tactical Data Link Authority Fys Canberra This money was raised from the proceeds of a BBQ held prior to ANZAC Day. Good Luck to the TM2 team in support of a worthy cause. Very inspired by your commitment to the Soldier On cause. Great personal endeavour for all the right reasons. Tim, Tash and Team T3 , this is a huge effort and I admire your commitment and efforts for such a great cause. Swim safe, good luck, and I look forward to hearing your story of success. The colder it is the faster you go!! Have a great swim team! The last of the Shindig On The Farm fundraiser money. Thanks again Tim for pulling this together. Supporting Super Tim and team!! NATASHA, SO PROUD OF YOU AND YOUR EFFORT TO HELP OTHERS. WOULD LOVE TO BE IN GB TO SUPPORT YOU AT THE TIME. LOVE AUNT SANDRA. Shindig on The Farm was a great night, thanks to Tim, Di, Cam and Hayden for all your hard work. Huge shout out to the Band of the Royal Military College, your music was amazing and greatly enhanced the event!! The band dig deep and played an encore... and so did the guests, this is the encore donation. Tim and team you are an inspiration and we wish you luck! X The GordonDyers. A great initiative! Good luck! Admirable cause! Well done colleagues! Good Luck Tim. Enjoy the swim, great cause. What an incredible challenge for a great cause! Wishing you all the best for your swim Tim! Grease up!! Good luck with the swim Tim and Natasha. Good luck Tash, great cause. Just keep swimming...just keep swimming. Wow what a big challenge Tim! Good on you, wishing you the best of luck. Best wishes Tim, enjoy your adventure, just keep swimming, we know you can do it. Cam Kathy. Go Tim! Fantastic cause and fantastic achievement!! Tim all the best to you and the team. Don t worry about the sharks its too cold for them haha. Well done on the support from the Stalker family. Best of luck to the team! Good work mate, a better man than me!! Good luck on your swim and enjoy! Go Team TM2 and our TPMers, Tash and Tim. good luck to the team, and I hope you wear thick wetsuits. Great cause wish you all the best in the challenge!! You ve got this Tash! Best of Luck Megs to you and the team on this amazing adventure and for such a great cause. What an amazing thing to do Natasha good luck! Impressive challenge for an equally worthy cause. I 'm with you in spirit! Love swimming and all it s benefits! Hope you make a million! Great effort TM2 team. All the very best! An amazing undertaking to support a wonderful cause. Tremendous effort and commitment to take on this task to swim the channel it shows real resilience and guts and I applaud you all for the sense of spirit, generosity and purpose I supporting Soldier On in such a way. Fantastic effort Andrew you are a much braver and clearly fitter! man than me. Maysie you 're nuts, but this is frigging awesome. Both the adventure and the cause. Good on you! Best of luck. Good on ya Tim, Legend. Great cause all the best for the swim! David says don 't drown, we need all the firefighters we can get. An amazingly impressive challenge for a great cause. Well done team and good luck , very proud of my KPMG colleagues! Good luck Tim. Your incredible! Wonderful cause! Good luck team! Well done guys! Looking forward to the whiskey! Awesome adventure you 're on and for a great cause. Good Luck! Brave effort. Best of luck and good on you for supporting a great cause. Full of admiration for the TM2 team and very proud of my wife Looking forward to attending your first fundraising activity. Looking forward to the whisky. Good luck to Tim and the team.